With such a task at hand, Aaron decided to draw inspiration from the Northern, industrial landscape found to create Strays - a short that presents a dark and unsettling world in which children have taken over a forgotten street, devoid of adults with no rules or boundaries. The streets background contributed to the integrity of the story and overall feel of the film. The area was once home to a large, close knit community, but around a decade ago the council began demolition work to make way for a new regeneration scheme, explains Aaron. Halfway through the demolition, the work came to a standstill due to lack of funds, and the half-demolished houses were abandoned. Several years on, the houses remain; crumbling and forgotten. Getting his hands on a camera from a young age initiated his interest in filmmaking. But directing was not Dunleavys first stop in his journey - it was VFX that caught his eye and he started to teach himself the basics while still at school. This is what pushed him into pursuing a film course where he not only found the skills he needed to transition from visual effects in to directing, but decided that if he were to produce his own material, he would need to write it as well. Armed with this experience, Dunleavy has been able to approach story telling in a unique and unconventional way. 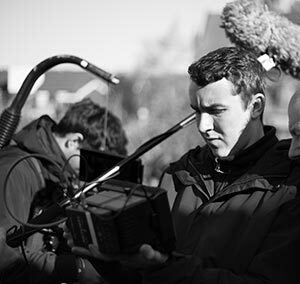 I do feel that my background allows me to shoot in a different way to many other filmmakers; I already know what is possible in post, so it gives me the ability to visualise the end product during the production, explains Aaron. The budget didnt allow Dunleavy to bring in a post house and with time as an issue, he decided to complete post himself, relying on a MacBook Pro (Mid 2012) with 4GB of RAM. His beginnings in post production were a massive help when it came to the edit, cutting the offline in Adobe Premiere, and then a smooth roundtrip into DaVinci Resolve to complete the online edit and final grade. In the grade, Dunleavy focused on crafting a strong, dark setting and believable characters. When filming outdoors, we were able to capture much of the final look in camera and only required finessing in the grade, however, the interiors were more tricky," says Aaron. "During the grade, a lot of work went into accentuating the dark and dreary feel that we'd tried to capture during filming, which took place in my grandma's old house. The end product looked exactly how I'd initially visualised in my head! The colour grading process was also very important for building on the different character traits within the film. I wanted to ensure the characters could portray the dark themes to provide sincerity to the storyline, according to Aaron. Using Resolves tracking capabilities, he tracked the eyeballs of the actors as a way to bring the corrupt world to life: I emphasised the eyes to make them super realistic and intense, as well as adding textures to other small features such as hands to make them seem more worn. An important factor Dunleavy had to bear in mind during the grade, was the fact that he was keen to keep all of the scenes as consistent as possible. I wanted it to seem like all the different scenes were happening simultaneously, reflects Aaron, so it was important to ensure the grade was as seamless as possible. Ensuring fluidity between each scene was crucial. Keen to create a timeless feel to Strays, a lot of time and effort was spent ensuring the short had a film like quality. This is my preferred look for my films; for this particular short, I wanted to create a world that didnt necessarily have relevance to whats happening now, in the present day, which I find the film look can achieve. Using Blackmagics URSA Mini 4.6K enabled Aaron to achieve this look. The 15 stops of dynamic range afforded by the 4.6K sensor allowed for a beautifully filmic image which was then heightened during the grade by applying a film grain. Subtle changes such as adjusting highlights in the sky contributed massively to creating the desired film aesthetic, and improve how the story was perceived. And that is why there was a lot of time and attention paid to to these small accents, says Aaron.